Lynn Baden repainting the "light blue" bookcase to match the dining room walls. In the back you can see a small end table, which will eventually go in the living room at one end of the couch. On the table at right, you can see a roll of paper towels. We thought that was our last roll, until I found two more in the spare room (where everything had been stashed) - in the next picture (below) you can see two rolls on the table instead of one. The Dining Room floor is mostly clear, and we've brought the dining room table in from the kitchen. Unfortunately one of its legs (the top right one in this picture) needs to be repaired before we can use it again. On the table at left you can see books in plastic bags, which we had been using to hold the bookcase and shelves up off the floor in order to paint their bottom edges. The dining room phone has been put back on the wall. The kitchen and dining room aren't ready for us to use for cooking and eating dinner, so we've been eating out a lot. 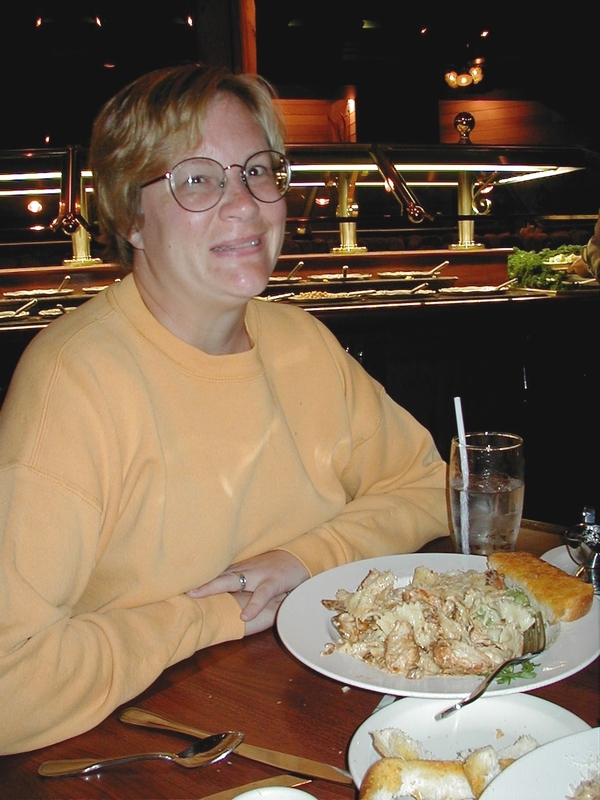 Lynn Baden and I went to Claim Jumper in Brea, where she finally tried the "Black Tie Pasta" that I like to order. [Note: Claim Jumper's website just crashed Netscape 4.6 on Windows 98 for me.] She likes the pasta - it's got cheese, bowtie pasta, seasoned chicken, and some garlic cheese bread too. The dining table is waiting to be repaired - you can see the top right leg is missing. And I need to put my crockpot away. I also couldn't find my car keys - it turns out they were under the crockpot on the orange chair. Dining table is back in dining room. We took it to D&K Refinishing in Fullerton. I've put the 2'x4' table away, and turned the table 90 degrees.